Cinnamon Roll Wreath – A fun, new way to serve a plate of cinnamon rolls for breakfast or brunch. Your guests will go crazy for the presentation, as well as the taste of these cinnamon rolls! I typically plan out the recipes I share with you all pretty far in advance. I have a list of favorite recipes and they’re all scheduled out meticulously. However, sometimes something new and unexpected comes along and ruins that entire schedule. Today, is one of those recipes. Enter the cinnamon roll wreath. Yes, you read that right. I first saw this on Sally’s Baking Addiction. If you haven’t met Sally, you gotta check her out! I’ve been following her for years. There’s not a recipe on her blog that I don’t trust. She’s a genius! Anywho, so I saw this recipe on her blog. I was so amazed at the beauty of the wreath. I had never seen anything like it. Ever! I loved the uniqueness of it. It was sure to be a hit at any brunch or party. I had a college football tailgate coming up and I thought everyone would love this wreath. Plus, it was huge and could feed a bunch of people so it was perfect for feeding a crowd. People went CRAZY for this wreath! The reaction from everyone was kind of shocking. I knew people would like it but man…everyone kept coming up to it and gasping in delight. I must admit, I felt pretty proud of myself that morning. Because of the reaction, I knew I had to make this again and share it with you all. 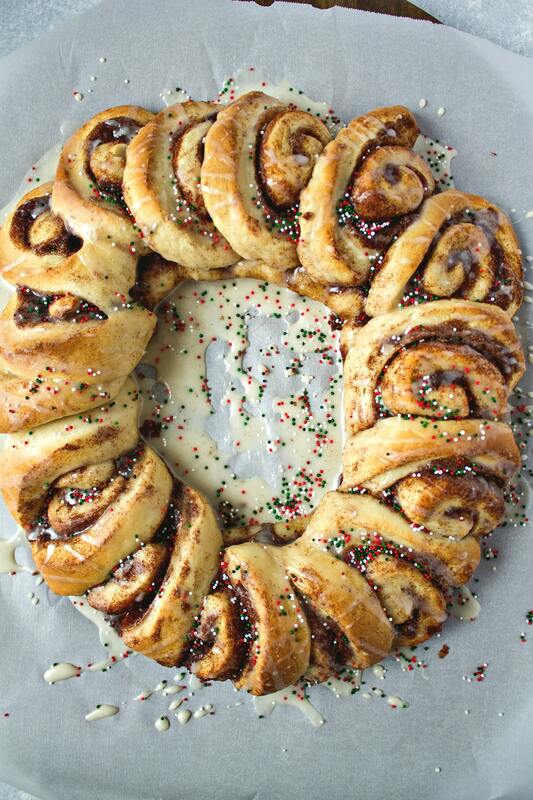 The best part about this wreath is that you can use any cinnamon bun dough that you want. I used the dough recipe from these apple pie cinnamon rolls. For the filling, I used 2 tablespoons of melted butter, 1/2 cup sugar, and 1 1/2 tablespoons of cinnamon. And don’t forget that icing! I used a simple recipe: 1 cup powdered sugar, 2 tablespoons milk, and 1 teaspoon vanilla. But you can use water you want. I have a great cream cheese icing recipe on those apple pie cinnamon rolls so feel free to use that, instead. Oh and I can’t forget those festive sprinkles! I added those at the end to make them perfect for holiday entertaining. Or even for Christmas breakfast! What’s even better, you can switch out the sprinkles for different holidays: hearts for Valentine’s Day, clovers for St Patrick’s day, patriotic sprinkles for 4th of July…The possibilities are endless! Just like I say every single time, you gotta knead the dough for the full 5 minutes. I always knead by hand because I can get a better read on the dough that way. Once it’s smooth and elastic, it’s ready for proofing. When rolling up the dough with filling, make sure you roll it tight and evenly. This will ensure that your cinnamon rolls are all the same size. When I made it the first time, half of the cinnamon rolls were huge and the other half were normal. So I knew better the second time around. Before you cut the dough, place it on your baking sheet. It is such a pain to transfer the cut log and try to keep it together. Trust me. Make sure the seam stays tucked and face down. The first time I made it, it wasn’t perfectly tucked so it slightly unraveled during baking. It was so slight so it only looked a little wonky and I don’t think anyone really noticed. But I noticed so it was enough for me to learn from the mistake. Just remember: even if it doesn’t look perfect to you, everyone else will be so amazed by it that they won’t even see those little imperfections. So don’t worry and give it a try! Now, you’re ready to tackle this cinnamon wreath! If you are still worried about trying it out, just shoot me a comment or email and I promise to help you as much as I can. You can do this! A fun, new way to serve a plate of cinnamon rolls. Your guests will go crazy for the presentation, as well as the taste of these cinnamon rolls! In a small bowl, add yeast and 2 teaspoons of the sugar to the lukewarm water and let it sit until it dissolves and the yeast begins to foam, about 10 minutes. In the mixing bowl of a stand mixer using the dough hook attachment, (or a large mixing bowl with an electric mixer) add scalded milk, melted butter, beaten egg, remaining sugar, and salt and mix on low speed until combined. Add half of the flour and mix until smooth. Add yeast mixture and continue to mix on low.Slowly add the remaining flour until fully incorporated. Remove dough from mixer bowl and then knead on a floured surface for 5 minutes. Make sure you knead for the whole time. The dough may be pretty sticky so add more flour to keep it from sticking to the surface, as needed. Remove dough, place in a greased bowl, cover, and set aside on countertop or warm place (I put in my microwave without turning it on). Let it rise until it is double in size, about 2 hours. When dough has risen, remove cover and, using your fist, punch the dough down and remove from the bowl. Roll out on a well-floured surface into a 12x18 inch rectangle. Spread the 2 tablespoons of melted butter almost out to the edges, but not quite. Mix sugar and cinnamon together to create the filling. Sprinkle filling evenly over the melted butter. I use a spoon to help me do this. Gently begin to roll the dough from the long end to the other, tucking the dough tightly and evenly. You should end up with a log 18 inches long. Grab a large baking sheet and place parchment paper on top. Place the cinnamon roll log on top of baking sheet, uncut and seam-side facing down. Using a serrated knife, cut the dough into 20 pieces, making sure NOT to cut all the way through. Lay each roll on its side in the same direction and gently begin to form log into a wreath. Place ends on top of each other to seal the wreath. Adjust each roll so it is facing up. You may have to cut the rolls a little more to move them the way you want them to go. Also, you may have to make the wreath into an oval to fit onto the baking sheet, like I did. Remember, it will rise during the second proofing and baking so you want to give it enough room from the edge of the pan. While you were adjusting the log into a wreath, the seam may have become exposed. Make sure to tuck it back under so it doesn't unravel more during baking. Add an oven-proof ramekin or small bowl to center to keep it perfectly round. Cover with plastic wrap or a towel and let rolls rise again until doubled, about 1.5 hours. Some doughs may take less so just keep and eye on it. With about 20 minutes left in the rising process, preheat oven to 350 degrees. When the wreath has finishing rising, bake for 23-25 minutes until deep golden brown. Remove from oven and let cool for 10 minutes before icing. In a small bowl, whisk powdered sugar, vanilla, and milk together until smooth. Once rolls are slightly cooled, drizzle icing evenly over the rolls. Quickly shake sprinkles over top before the icing hardens. Serve right from the baking sheet and let people pull or cut their own slice. To save time in the morning, you can make these the night before. Once you've arranged the wreath, cover and place in the fridge overnight. In the morning, pull them out and let them get to room temperature for about 1 hour. Bake as stated above. It'll save you a couple of hours for sure! Tutorial provided by The Kitchn. This looks delicious! and it’s so fun and festive for the holidays! Ok, this looks delicious AND it’s so pretty! A total win win. Yum. This looks amazing! It would be perfect for Christmas morning. I totally understand and agree that sometimes inspiration comes along and totally wrecks a carefully planned editorial calendar! Haha yes of course! I think it should work out fine if you arrange them in an oval. Just make sure to place a bowl in the center to keep the circle intact. How fun! Pinned this for later. This is so festive. What a great idea for Christmas morning. Can’t wait to try it. Pinning!! What a terrific Christmas morning idea! Totally pinned this recipe! It’s adorable and look so delicious! I can’t think of anything more perfect for a Christmas morning breakfast treat! This is not only delicious looking, but I love that it’s so simple too. This is such a good idea!!! I wanna try this for Christmas am! I love how festive this is! I want to make one for my kids for christmas breakfast. I think they will enjoy it and the sprinkles were a great touch as well! I love this idea!! It’s like monkey bread but better! Thanks so much for the fun recipe! What a lovely holiday sweet treat! It looks amazing and so pretty! That wreath is adorable!! I love how yummy it looks, and it gives the cinnamon rolls such a festive look. It would be perfect for Christmas morning! I love Sally’s Baking Addiction! Your wreath turned out beautifully and you’ve inspired me to try out this cinnamon roll wreath for myself! Thanks so much! I hope it turns out well for you too! You did a great job with this. I would definitely make this for my family. We love cinnamon rolls. This looks so delicious and fun to do! I’ve been teaching myself to bake bread lately and this is perfect. Would be great for Christmas morning. Looks amazing! I wish I was gone this year to make them – I might have to save for next year. I think they will be a winner! Oh my gosh!!! these look so good. I love cinnamon buns they are my fav. OMG Im going to be thinking about this all week now! this is the cutest idea/recipe! I love the christmas sprinkles on top and who doesnt love cinnamon rolls! I’m pinning this for later so when my mom asks me to make christmas breakfast, Im prepared! thanks! I love cinnamon roll anything, and this just looks perfect! How fun for Christmas, too! Oh yum, this looks amazing. Perfect for Christmas too! This looks so good – I LOVE the sprinkles! A great breakfast idea for Christmas! Oh man I know what I am making this weekend!!! Adding this to the list of things to make! I definitely can’t wait to try this recipe out. It looks delicious!! What a fun breakfast idea for Christmas morning! And it looks pretty easy too! I love cinnamon rolls, but this is such a cool way to make it festive for the holidays! This is incredible! I can’t even imagine a better breakfast for Christmas morning! So festive, and I’m sure it’s delicious. We are huge into cinnamon rolls at our house. Especially around Christmas time I will have to try this the next time I make them. Cinnamon rolls are one of my favorite winter breakfast foods. I have never made my own from scratch though. Yours looks delicious!!! I’m making this for Christmas Eve morning. Every time I make something from scratch, my kids act like I’m a miracle worker. This is going to blow their minds! so this is totally happening for Christmas morning! Okay this looks so pretty and delicious! I think I’ll make this for my hubbys birthday coming up. These are so delicious …. And I love how you have given such proper instructions … Kudos to you … Happy Holidays ! This looks so pretty! I might try this out for Christmas morning! Thank you for the recipe! Really need to do some Christmas cooking. Might have to give this a try sometime this week.